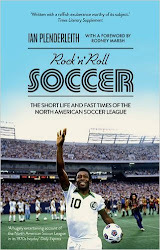 ROCK N ROLL SOCCER: "Thank Goodness for Rock n Roll Soccer"
"Thank Goodness for Rock n Roll Soccer"
“What the hell were they thinking?” writes Ian Plenderleith in 'Rock 'n' Roll Soccer: The Short Life and Fast Times of the North American Soccer League.' After one season, The Quicksilvers moved to San Diego and Team Hawaii became the Tulsa Roughnecks." For those of us who lived through the NASL, 'Rock 'n' Roll Soccer' brings back wonderful memories and enlightens us on aspects of the league we may not have realized. For those too young to remember the NASL, it’s a chance to comprehend how soccer took a foothold in the USA and meet the fascinating characters who made it happen -- with laugh-out-loud moments, to boot. Rock 'n' Roll Soccer: The Short Life and Fast Times of the North American Soccer League by Ian Plenderleith (Thomas Dunne Books 2015) 350 pages.